Blackheads on your cheeks can ruin a near-perfect complexion. They are caused when dead skin, bacteria and other debris clogs the pores. When this combination gets pushed toward the skin's surface, it turns black from contact with air. 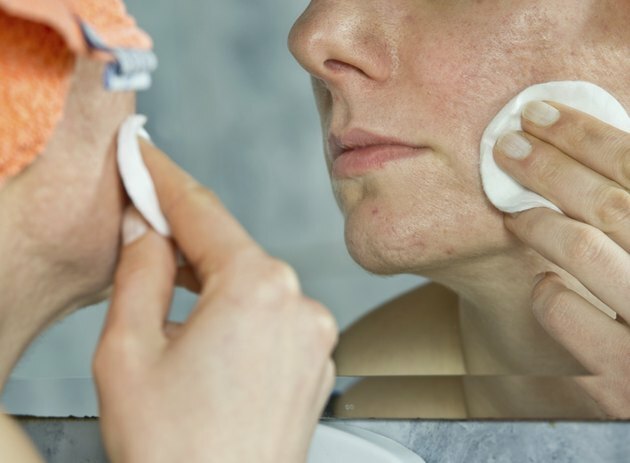 You might be tempted to pick and poke at the blackheads on your cheeks to get rid of them, but this may make them worse. Blackheads are a form of acne and require special treatment for effective healing. Wash your cheeks twice a day with a facial cleanser containing benzoyl peroxide or salicylic acid. Benzoyl peroxide is more effective, but can also be a bit harsh for some skin types; if you can't tolerate it, choose a facial cleanser with salicylic acid instead. Both products help to clear pores and treat blackheads. Exfoliate your skin to help dislodge clogged pores. You can exfoliate with a store-bought scrub, brush or even just a mixture of baking soda and water. Exfoliate daily if you have oily skin; if your skin is sensitive or dry, only exfoliate once a week. Treat your cheeks to a weekly oil-absorbing clay mask. Apply the mask according to the instructions and leave it on for 10 to 15 minutes. The mask soaks up the oil and helps to get rid of blackheads. Apply an acne spot treatment to the blackheads on your cheeks. Choose a cream that contains benzoyl peroxide or salicylic acid. Apply it once a day or according to the manufacturer’s instructions. Always wash makeup off your face before bed. This will help to keep your skin clean and prevent future blackheads. Use the clay mask weekly even after the blackheads are gone to help prevent additional breakouts. Visit a dermatologist or an esthetician who can professionally extract stubborn blackheads from your cheeks.